The Idea of BigShoe “Doing good and Football”: When would this fit together better than in the year of a World Cup? BigShoe founder Dr. Igor Wetzel had just returned from South Africa from a trip to children undergoing surgery, as the initiators of the aid organization and their supporters – including, of course, WOM – met in Wangen in the Allgäu. On the occasion of this year’s World Cup in Russia, eleven children could be helped who now have a chance of a carefree life. Do you like football, Mr. Kupka? Our WOM Kids Reporter Team was once again active for BigShoe. Fanny Tschepe (13 years), Nina Michel (15 years), Gina Gütlhuber (15 years), and Lorenz Hohenhaus (17 years) interviewed CFO Oliver Kupka after WOM became the proud owner of its own symbol shoe with the No. 9. 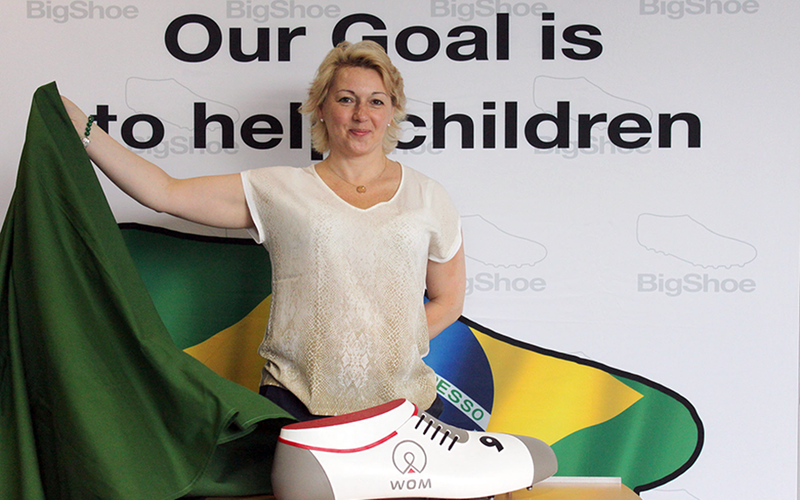 The surprise for WOM employees was fantastic: Today, the original BigShoe with a WOM design was handed over in a solemn ceremony. It is a symbol of the company’s commitment to the activities of the BigShoe initiative to help sick children. When terms such as pin shot, jet or snake technology are soon being thrown around at WOM, it is not about the latest medical technology developments but simply the most important football shooting techniques. 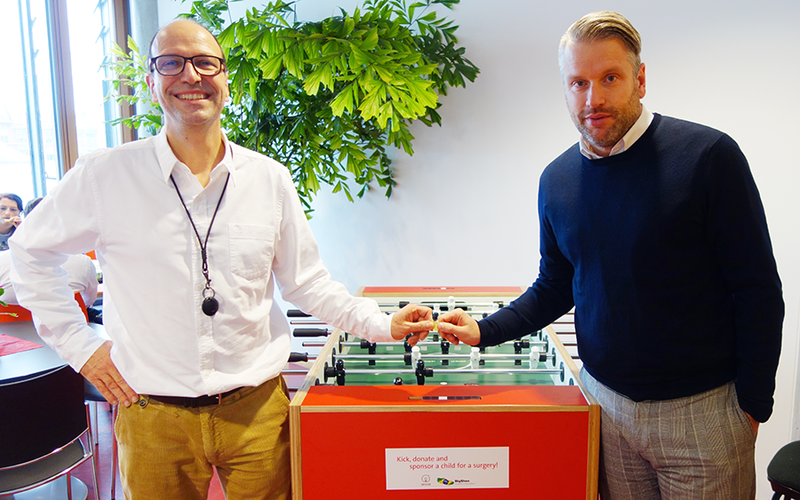 “Foosball” tables have arrived at the Ludwigsstadt and Berlin sites. But this is not all about having fun during breaks. The collected game money is doubled at the end of the month by the company and donated to the charity BigShoe e.V. from the Allgäu.